Corps officials are soliciting Marines to consider a lateral move into a job with opportunity for new experiences, deployments and huge cash bonuses. The demand for Marines in the 0211 counterintelligence/human intelligence military occupation specialty has more than doubled over the past decade. The Marine Corps’ intelligence community is asking sergeants, corporals and even some lance corporals, to consider moving to the 0211 MOS. Not much was known about what 0211s did until the U.S. invaded Afghanistan and then Iraq. CI/human intelligence Marines assisted commanders with gathering information they needed to be successful on the battlefield. Now as things wind down in the Middle East, commanders all over the world want to continue working with them. From working undercover to interrogating detainees and protecting bases in the homeland, 0211s are in demand. The Corps is looking for mature Marines who are comfortable interacting with strangers, without a lot of input from leadership, to consider making the shift to intel. Marines who do so can find themselves deployed with a Marine expeditionary unit, working with foreign militaries or even with U.S. governmental agencies completely outside the Corps. “If you still want to be a Marine but hang your uniform up for a couple of years, wear a suit and grow your hair long, this career field will offer you an opportunity to do that,” Moyer said. Pick up a copy of this week’s issue of Marine Corps Times for the complete story, or read it on Marine Corps Times Prime here. You should be ashamed of yourselves. This cover not only depicts 0211’s in an entirely fictional manner, but shows that you have no idea of the consequences of what you publish. The Marine Corps Times is sold and displayed in base exchanges all over the world. This includes places where we are currenly engaged in combat operations, such as Afghanistan. Third-country nationals ALSO work on those installations. How long do you think it took before one of them saw this cover, bought a copy, and then shared it with all their friends? You have not only reached a new low in your “journalism,” you have also jeopardized current operations, and frankly, good Marines’ lives with nonsense like this. In case you were unaware, spies (in the traditional sense) are not afforded protection under the Geneva Convention. Who do you think will be the first Marine tried using evidence provided by a publication sponsered by the Marine Corps? 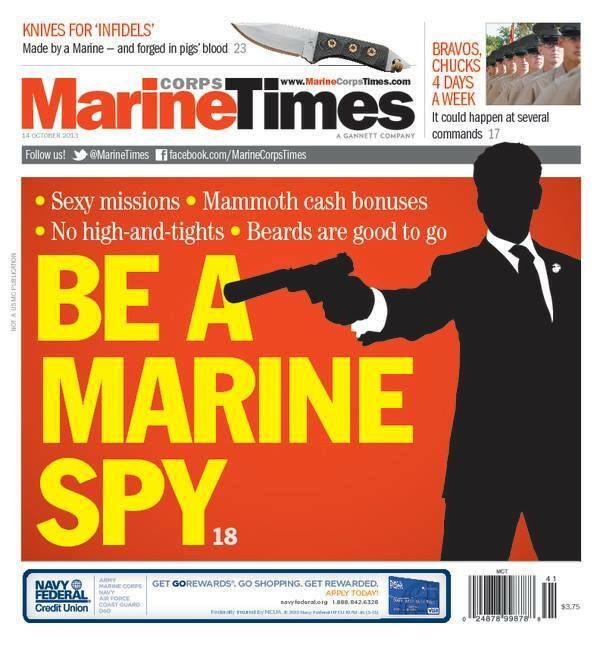 Once again, the Marine Corps Times has shown it is nothing more than yellow journalism and cares about nothing more than sales and circulation. Thank you for your feedback, but please take some time to read the story. You’ll see it was facilitated by the director of Marine Corps Intelligence at the Pentagon. In other words, it was reported with input, support and consent from his staff. We have no doubt the concerns you’ve raised here were evaluated well before our interview requests were granted. Nothing in this story infringes on operational security or risks the safety of those 0211 Marines currently in harm’s way. By and large, this is a discussion of the career field and the Marine Corps’ continued need for personnel to fill a growing demand across the fleet. Please consider, too, that the story was published well after the release of Marine administrative message 443/13, which explores in detail the active effort to recruit more qualified Marines to these jobs. That’s a public, unclassified document. Lastly, regarding the cover image, we regret you took offense. That was not our intent. Our covers are designed to intrigue prospective newsstands customers. We never imagined anyone would view this rendering of 007 for more than it is — an eye-catching entry point to what we consider a fair and factual piece of reporting. Andrew, good response. Nothing about the article was telling or gave anything operational away that you can’t find in public media. Now, had you gone at length into the 26XX field, we might be having a different conversation! :o) However, I also thought the cover art was clever and funny. And for the record, I’m a retired 2602 CWO4. I was a little 0311 who got lucky enough to work in our CLIC… I got to see alot of the behind the scenes big picture stuff and occasionally worked with our HET guy; It was fascinating the kind of work they do. If I had decided to stay in, I probably would have lat moved to intel. There is one fact that the article did not discuss, but should have covered. Once the Marine gets out of the service (even more of a possibility with a downsizing being considered), a properly trained 02 could find work either as civilian or contractor at several federal agencies, such as FBI, Secret Service, FINCIN, as well as any one of the intel agencies (NSA, CIA, DLA).